New page access: notification that you or one of your groups have been given access to a new or existing non-public page. You do not receive notifications about pages accessible to all logged-in users and the public. 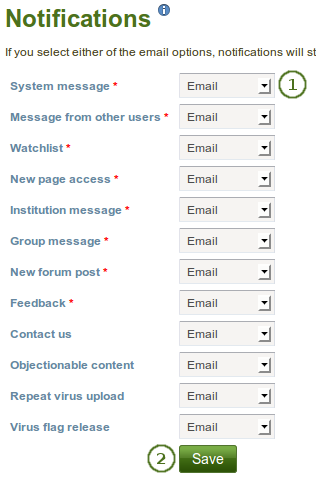 Only administrators see the last 4 notification types of “Contact us”, “Objectionable content”, “Repeat virus upload” and “Virus flag release”. None: This is only available to administrators for administrative notifications. They can opt to not receive any notifications for certain types.